Members of Frack Free Denton Adam Briggle, Niki Chochrek and Tara Hunter were arrested June 1, 2015 for blocking the entrance to the Vantage Energy drill site in Denton. SB 1993 would make this kind of protest a second degree felony. Courtesy of Frack Free Denton. A new Texas bill would have a "chilling effect" on environmental protests, according to a coalition of North Texas environmental advocates. Local environmental groups including Dallas Peace & Justice Center; 350 Dallas; American Muslims for Palestine, Dallas; Climate Reality Project, Dallas; CodePink Greater Dallas; Dallas AFL-CIO; Dallas Palestine Coalition; Dallas Sierra Club; Earthworks Oil & Gas Accountability Project, Texas; Joppa Freedman's Association; Liveable Arlington; North Texas Dream Team; Pax Christi Dallas; RAICES Dallas; SEED Coalition; Southern Sector Rising; Tarrant Coalition for Environmental Awareness; Veterans For Peace Chapter 106, North Texas; Waco Friends of Peace/Climate, are urging North Texans to oppose the bill. The Critical Infrastructure Protection Act, or SB 1993, is still in the Texas Senate Natural Resources and Economic Development Committee but could be voted on as soon as this week. According to Earthworks, the law is modeled after draft legislation promoted heavily by the American Legislative Exchange Council (ALEC). The bill establishes that a person who, without the consent of the owner, intentionally or knowingly damages, destroys, vandalizes, defaces or tampers with a critical infrastructure facility or who intentionally or knowingly impedes, inhibits, or interferes with the operation of a critical infrastructure facility, would be charged with a second degree felony. “Critical infrastructure” pointedly includes all manner of oil and gas operations. Other critical infrastructure designated by the bill includes electric power generating facilities, chemical manufacturers, water treatment facilities, telecommunications centers, railroad switch yards, radio and television transmission facilities, steel making facilities, dams and concentrated animal feeding operations. 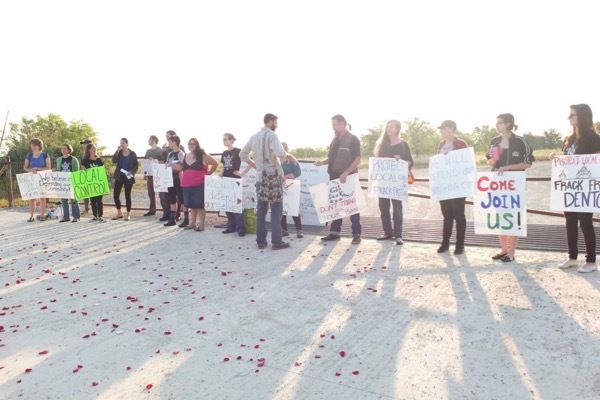 Frack Free Denton protesters June 2015 at the Vantage Energy drill site in Denton. Rita Beving, Dallas-based organizer for Public Citizen, said the law is clearly aimed at squelching gas industry protests. The inclusion of CAFOs, also known as factory farms, seems designed to discourage animal rights protests as well. The bill renders acts of civil disobedience now considered to be misdemeanors, as second degree felonies, punishable by up to 20 years in prison. Beving said that’s equating such acts as blocking an entry to a facility or chaining oneself to a piece of equipment with other second degree felonies such as assault with a deadly weapon, attempted murder, theft of $100,000 to $200,000 and indecency with a child. 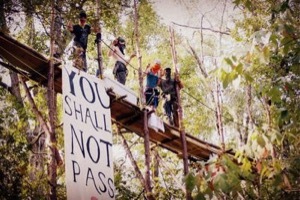 Tar Sands Blockade protestors climbed trees in 2012 to block clearcutting for the construction of Keystone XL pipeline through East Texas. Courtesy of Tar Sands Blockade. In addition, the bill states that organizations that the individual is associated with could be held liable. Beving is calling on environmental advocates to call members of the State Natural Resources and Economic Development Committee and urge them to protect free speech and vote ‘No’ on SB 1993. She said the bill applies to not only environmental activists but landowners who may simply be protecting their property. A similar bill HB 3557 has passed out of committee. “It’s not as egregious,” said Beving. She expects there to be several versions of the bill floated, with legislators hoping to slip one through. Yolonda Blue Horse, board member for Dallas Peace and Justice Center, drove to Austin recently to testify against SB 1993. “It’s infringing on our first amendment rights to protest,” said Blue Horse. “There are already laws in place to protect corporations from protestors." She said she’s also concerned about the legislature’s definition of critical infrastructure. See the Campaign to Stop Anti-Protest Bills to find committee members' contact information and talking points.